It was the most populous province in China before Chongqing was made its own city-state, and is still the third most populous. The majority of Sichuan’s population are Han Chinese, but there are also big groups of Tibetan, Yi, Chang and Naxi minorities. I am resisting the temptation to write a bunch of points about various languages that are interesting to me but probably not interesting to the rest of you! Famous Chinese poet Li Bai was born in Sichuan. Our delayed flight landed and we wandered out into the dark to negotiate a cab ride to our hotel. I’d been told it should take 1.5 hours and cost 200 RMB. Having just spent 5 days in waaarm Xishuangbanna, the cold air was a shock! The forecast for the next day was 0-15 (32-59 F). We got a driver who recognised our hotel and I called ahead to make sure they were expecting us. As soon as we left the airport we began to descend. There was almost no light anywhere bar the headlights of other cars we occasionally came past. Some way into the journey we REALLY started to descend, down windy roads that were well maintained, if not straight. In the pitch black we couldn’t see much – some road signs, some pine trees. After a while we began to wonder just how high up the airport was, especially given that I thought our destination was at about 2000m above sea level! When we arrived the staff were very friendly and helpful, especially given the VERY late hour! 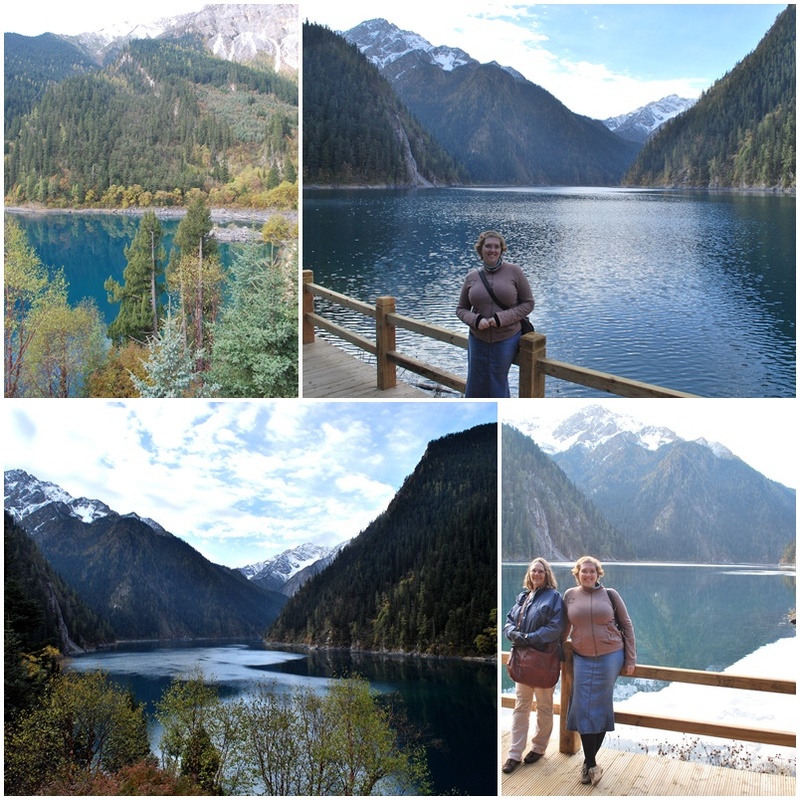 I chatted with them for a while about how best to use our one day at Jiuzhaigou, and they offered to book a taxi to take us back to the airport in the evening. Very early in the morning we walked the short distance from our hotel to the entrance of the park alongside a canal of fast moving milky-green water. In the light we could see that our hotel (and all the rest) were nestled between two tree covered ridges. Once we got to the gates the magnitude of the place was apparent – crowds of people milled around everywhere as I queued for tickets. The entrance fee was high for China (nearly $50 each for entry and bus travel) but well worth it. Is located in the Aba Tibetan Qiang Autonomous Prefecture of northwestern Sichuan province, near the border with Gansu province, the area has been inhabited by various Tibetan and Qiang people for centuries. The name comes from the 9 Tibetan villages along the river valley (2 outside the park grounds). 5 of the 7 in the park are still inhabited, although the population of about 1000 subsist on tourism, having been banned from agriculture. 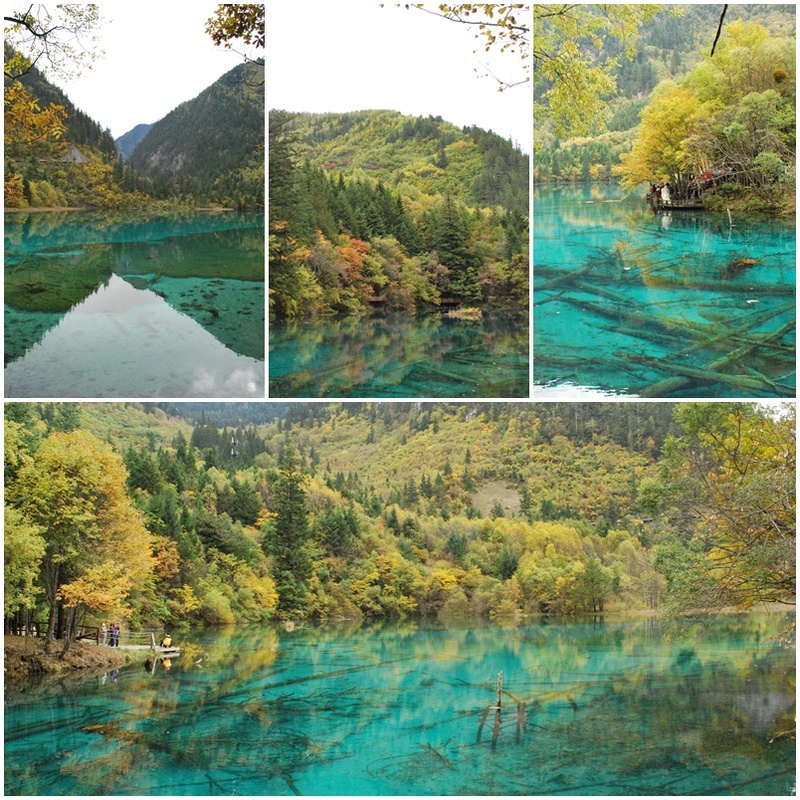 Officially discovered by the government in 1972, Jiuzhaigou was made a national park in 1982 and declared a UNESCO World Heritage Site in 1992. 5,000 tourists visited in 1982, and over 1 million in 2002 (the vast majority being domestic tourists). About 12,000 people a day visit during the high season (only 7,000 a day the rest of the year). Giant Pandas are indigenous to the area, but there are only about 20 isolated individuals living there now. The water in the park originates in the glaciers and there are high levels of calcium carbonate. 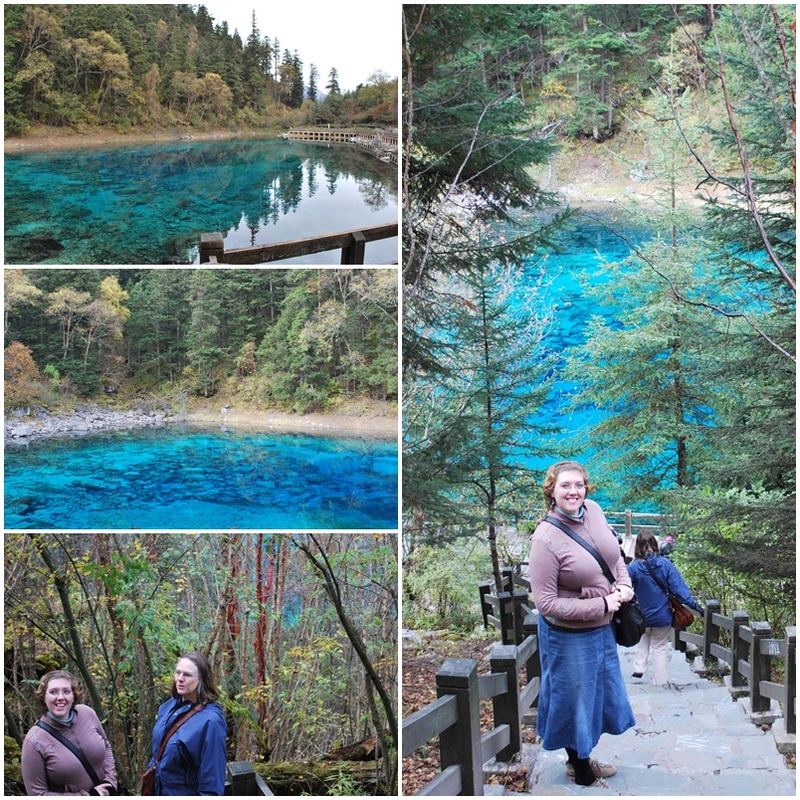 We took a bus 15km to the top of the Shuzheng Valley, past 37 ribbon lakes, clear water reflecting the mixed pine and deciduous forest on the hills. We caught glimpses of snow capped peaks on both sides of the bus as we climbed. At the top of Shuzheng Valley we changed buses and headed up Zechawa Valley. Our bus went all the way to the top, an 18km drive, dropping us off before 8am – we were one of the first groups to get up there. The bus stop at the top of the road looked down over Long Lake (Chang Hai). Long Lake is the largest, deepest, and highest lake in the whole park. It is over 7km long, 40-100m deep, and is 3150m above sea level. It is fed by melting snow and is said to have no outgoing waterways – water is lost from seepage only. Several snowy peaks stand around the lake, even the nearest crests falling sharply to the water’s surface, all of them reflected clearly in the deep blue water. The air was crisp and clean, the sky blue, and the rising run cast golden light on the highest peaks. In short, it was breathtaking. We rode back down to the top of Shuzheng Valley and followed a walking path from the road down to the Nuorilang Waterfalls. (See the top two pics below). The Nuorilang Falls are 20m high and 320m long. The path wound along beside them, through large fir trees. 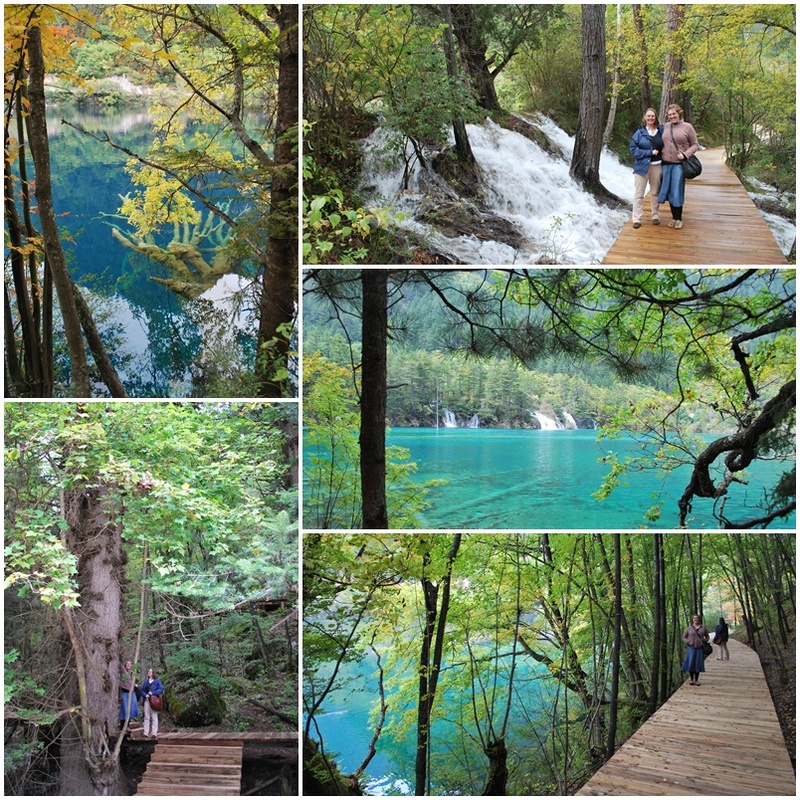 The wooden walking paths really are fantastic – solid and a good 1.5m wide in most places, they weave through the forest, around lakes and over waterfalls. Most are well separated from the main road. Next we took a bus down the valley to Rhinocerous Lake (see the bottom two pics below). Its name comes from a story in which a Tibetan lama riding a rhinocerous plunges right into the lake, distracted by the beauty of the area. It is one of a series of 19 ribbon lakes that are collectively called the Shuzheng Lakes. These lakes, and the 18 above them called the Nuorilang Lakes, were formed by the passage of glaciers. 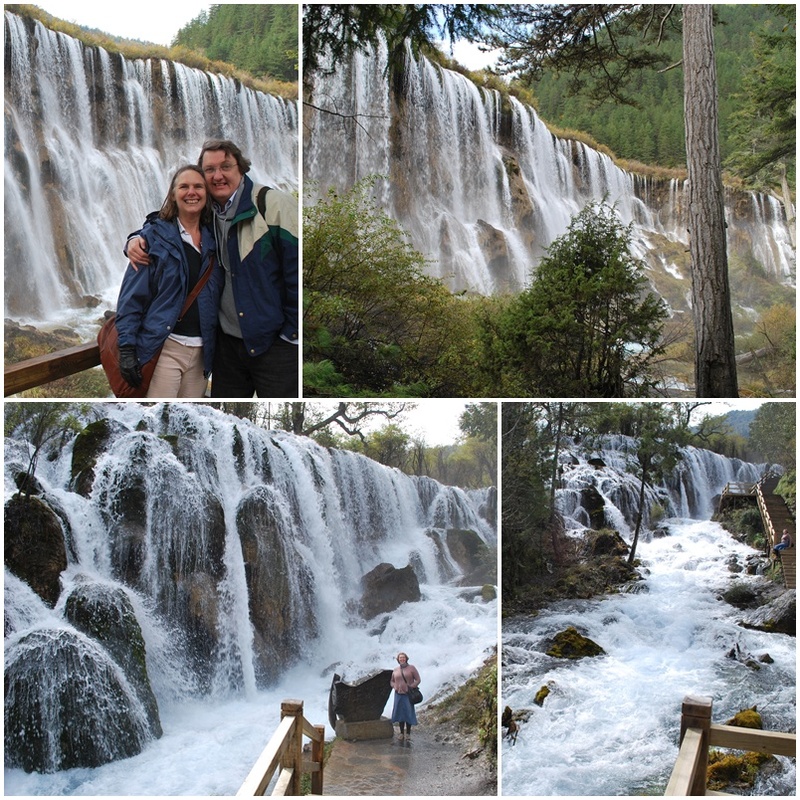 We walked paths down through the lakes, past the Shuzheng Falls – 25m high and LOUD as water churned white passes quickly down the valley (see the bottom two pics above). The sections of valley between the deeper lakes are full of small trees growing right in the water. It takes a while to realise that the whole area is flooded with fast-moving water (top right pic below gives you an idea). The path crossed to the far side of the lakes, away from the road. We walked under huge trees that seemed to be right out of fantasy novels. We watched brightly coloured birds hop across the paths. We wandered through a hillside meadow, full of clover and other wildflowers. We stopped to rest in a large wooden pavilion built for just that reason. We marvelled at calcified trees under the surface of the water (top left pic below). We saw so much bright aqua water it began to seem almost normal. After a few kilometres, we got to a point where the path branched – we could continue down or cross back to a bus stop on the road. We decided to cross back, but the lake below looked so pretty we decided go just a *little* further before doubling back. When we finally made our way to the other side, we hailed a bus and travelled back up the Shuzheng Valley, then on to the top of 18km long Rize Valley. At the top of the road is a clearing surrounded by “primeval forests” and jagged snow capped crags, including Sword Rock, a 500m high razor like cliff. We got back on a bus and headed down, passing 2.3km long Swan Lake, shallow Grass Lake filled with reeds and other vegetation, vast Arrow Bamboo Lake (now back down to an elevation of over 2600m), Panda Lake, and the Panda Waterfalls, which fall nearly 80m in three tiers. 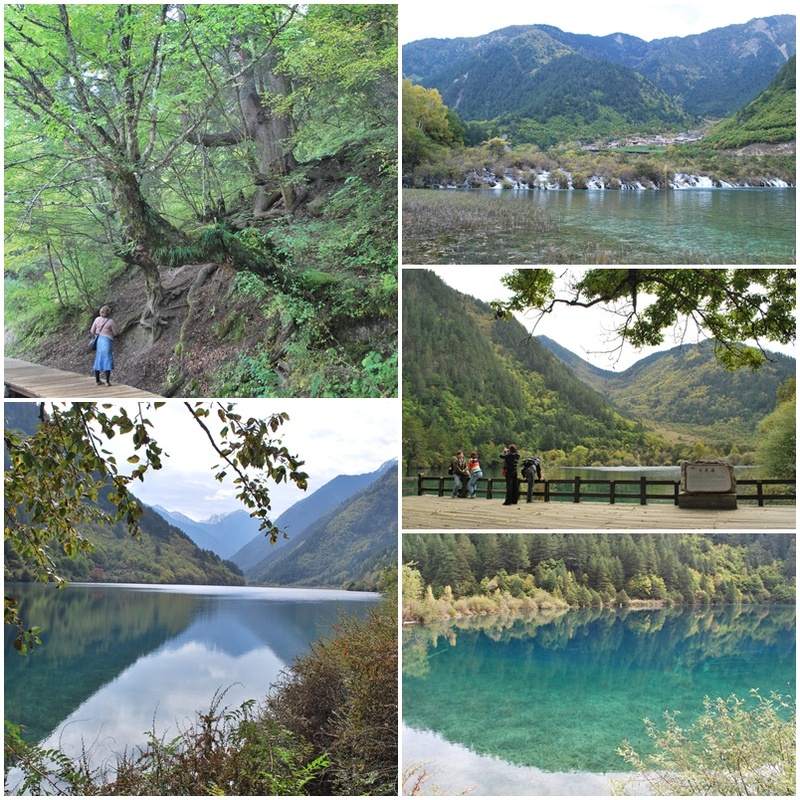 We stopped at Five Flower Lake (Wuhua Hai). It is 5m deep and a range of brilliant blue and aqua colours. Beneath the water are many fallen trees, all clearly visible. The surrounding hills were filled with deciduous trees that were changing colour. The reflections on the still water were gorgeous. Finally, we took a bus back to the front gate of the park and walked back to our hotel. On the way back we noticed something we’d missed that morning – a spot where two rivers met to form the canal we walked beside. This was notable because the two were clearly different colours – both milky, but one greenish and the other (flowing out of the park) decidedly blue. At the hotel the driver was waiting for us, even though we were early. This turned out to be advantageous – we had light enough to see all the scenery on the way back to the airport. The mountains became more and more impressive as we climbed. Eventually we were beside a range of snow capped peaks our driver said were 4000-5000m high. When we reached the 17km long plateau that would lead us to the airport, we could still see the snowy crags above us, as well as what seemed to be yaks grazing the grassland. The airport seemed to be a flattened hilltop, surrounded by sharp snowy peaks – quite a sight! A sign on the way in put our curiosity to rest – the airport is 3600m above sea level. We arrived so early that I looked into getting an earlier flight back to Chengdu, but our airline wasn’t running an earlier flight. In the end, there were so many delays in and out of the airport that the one flight scheduled earlier than ours left later than us. Less than an hour later we arrived in Chengdu, which will be the subject of part 5, the final installment. Stay tuned!